The working life of ranch men and women and the landscapes of rural Texas form part of Sarah Pierce's background and have provided wellsprings for her imagination. Raised in west Texas and now based in the hill country near Austin, Pierce knows the the life of ranchers, cowboys, and their families, stories, and songs she frames in details of weather and memory. Pierce has a voice well suited to her stories, a fine alto that fills her songs with just the right emotion to make them lasting and inviting. Her most recent recording is called Barbed Wire. Dave Ellis knows ranch life too. He was working horses by the time he was ten, in California where he still lives, and still works horses, using a gentle technique drawn from from the vaquero tradition of the Hispanic southwest centuries ago. Dave has always been a musician, too, working to sing and pass on songs from the cowboy life present and past. His singing caught the ear of JIm Pugh as he was beginning to set up the Little Village Foundation with the idea of preserving and gaining wider audiences for music that may not be well known but tells stories worth hearing. The cowboy voice of Dave Ellis seemed a natural fit, and so the album With Any Luck But Bad came about. Colorado has been both seedbed and inspiration for music, from Judy Collins to Gretchen Peters, from Hot Rize to Front Range. The Railsplitters are among the latest to follow this trail, bringing a particularly western flair to their original songs and interpretations of music from bluegrass and other sources. Banjo player Dusty Rider writes much of the band's original material, and along with singer Lauren Stovall, mandolinist Peter Sharpe, bassist Leslie Zeigler, and fiddle player Christine King, builds a sound that finds the band tending toward high energy pieces but equally capable, when they choose to, of giving elegant interpretation to slower pieces as well. Their most recent recording is called The Faster It Goes. Ian Tyson has seen things speed up and slow down in the west across his career. During the folk revival days of the 1960s, his songs Four Strong Winds and Someday Soon suggested the direction he'd soon take full time: that of a rancher and a writer of songs about life and lives in the west. These days, when he's not working his ranch in Alberta or on the road with his music, he goes down to a little stone building near his ranch house to write his songs. His most recent recording is called Carnero Vaquero. It includes, among other things, the song Wolves No Longer Sing, a meditation on change framed in sound and image of the west. The west of Stephanie Davis often has to do with change, too. Davis is a top songwriter whose music has been recorded by superstar Garth Brooks, rising country stars Joey + Rory, and bluegrass award winner Claire Lynch, among others. Davis took her run at Nashville -- she and Brooks were part of the group of new songwriters coming up the ranks in town at the same time -- but though she was successful at it, she decided to return to her native Montana. There she has continued to write and to tour and release albums at times. Though her songs have often been recorded by others, it's fine to hear them in her own voice, and to come upon gems that others may not have gotten to yet. You might look for her albums Crocus in the Snow and Home for the Holidays, and you can also find one track from Stephanie on the Putumayo holiday collection Acoustic Christmas. 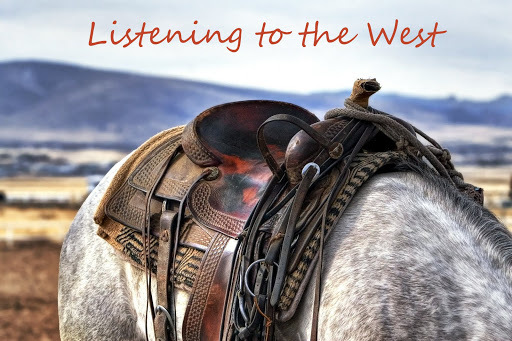 Joni Harms knows the west from several points of view too, as her album titles Let's Put the Western Back in the Country and Cowgirl Dreams suggest. Raised on a ranch that has been in her family for years, she herself raises both cattle and Christmas trees out in Oregon. That's when she is not writing songs or out on the road with her music; in addition to playing many dates in the United States and Canada, Harms is very popular in Europe. She loves that life, but also, as she points out in this song, it is the quieter side of the west that fuels her stories and her dreams. Kerry Dexter is music editor at Wandering Educators. You may reach her at music at wandering educators dot com. You may find more of Kerry's work in National Geographic Traveler, Strings, Symphony, Perceptive Travel, Journey to Scotland, and other places on line and in print, as well as at her own site Music Road.